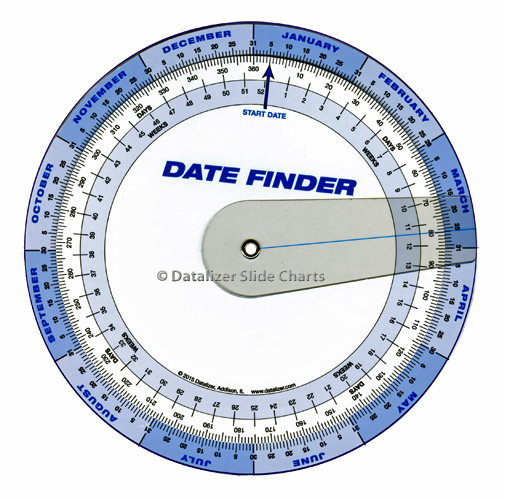 New and Updated: The Graphic Calculator style date finder used by professional planners and schedulers. Now constructed of all white plastic with a clear plastic cursor arm. The same top quality product in a new cost saving size. Materials: White plastic top and bottom wheels with clear plastic cursor. This Date Finder can also be custom printed with your company information and in your choice of colors. Let us know what you need and we will provide a quote. Minimum order quantity for a custom version is 500 units. This stock item is ready to ship.